Recently I've been noticing that I've been having some 'speaking' issues. To be more specific, it actually has to do with how I'm pronouncing some English words. I normally don't have any difficulty and if you asked anyone who knows me, you'd be told that I was never one who had major issues with diction. However, in the past two weeks, I've really been having more 'slips' than usual and though it's hilarious when I make such mistakes at home, the thought of committing them while talking to others (translate: Americans) scares me. I think it would just be too embarrassing. I'll give you two examples, although these were not the actual mistakes I've made. Instead of saying 'potato chips', I would say 'potato chEEps'. (long E sound, instead of short I). Or perhaps while eagerly trying to tell an intriguing and riveting story to my husband about 'Christopher' (and no, that's just an example and not an actual person we know), I would have pronounced his name as 'ChristoPer' (no F sound, which is absolutely embarrassing especially among Filipinos who are doing their best to speak proper English). My tongue must be getting tired. No matter how fluent I am in English, the fact is that this is still only my second language. 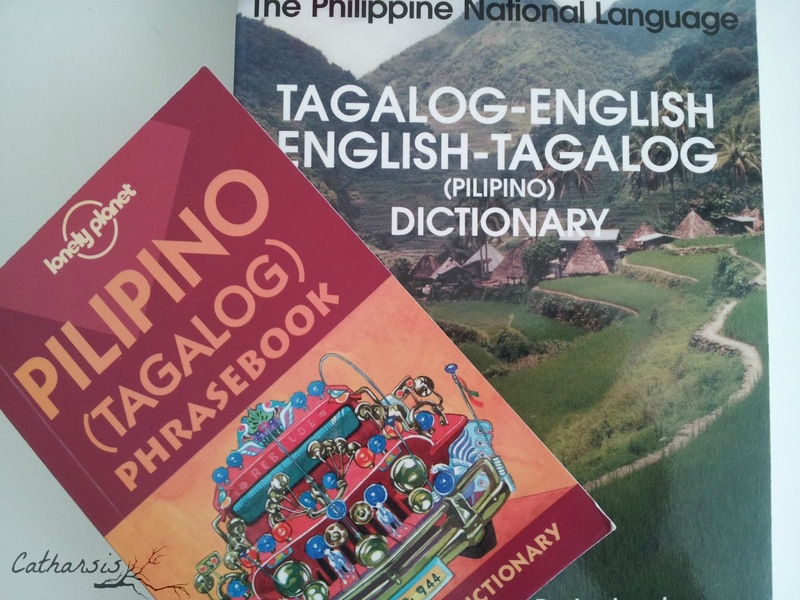 I still prefer to speak Tagalog (ta-ga-log, all short vowel sounds) if I could have my way. It's still Tagalog that is effortless for me and most automatic for my tongue, and let's face it...my brain. A question most asked to bilingual people who have learned to speak English (or some other foreign language) quite fluently is this: In what language do you think? In other words, people are curious if we are constantly translating in our heads before we can even utter anything coherent or sensible in English. I always find it difficult to answer this question because most times, there is no more clear, or word-per-word translation going on. I have been speaking both Tagalog and English since childhood and admittedly, it all just flows. However there are days when I feel 'stuck', or a little 'lost' and 'rusty'. I think these days signal the tiredness, the longing for my native language. I'm still fairly lucky that my spouse understands basic Filipino, but I know communication with him would still be much simpler if I just spoke English. I mean, we already have a lot of misunderstandings as it is, with me speaking proper English. God knows what level of havoc we'd manage to create if I decided to communicate in Tagalog! As for my son, well that's just going to be impossible. All he knows are some (and by some I mean no more than 10) basic Filipino words and I'm not proud of that at all. I do want to teach him the Filipino language but let's save that project for another day, shall we? All I can tell you is that right now, I feel that my tongue needs a break, a vacation from English. I think it wants to have a decent conversation with someone in straight Tagalog. I want to be able to tell a story, with all its gory details and my own thoughts and crazy input, in pure, highly emotive, Tagalog. Is that too much to ask for?? (I guess it is when you live in Middle Tennessee). It's exhausting, trust me. Trying to pronounce, enunciate, and accentuate 'properly' all the time when it's not the natural tendency of the tongue you were born with, can wear you out and definitely has its limits. Since it's already the weekend, maybe I'll spend the next two days speaking more Tagalog and drowning myself with Filipino movies and songs, just so I have my 'break' and reconnect with my Filipino tongue and consciousness. In the meantime, I humbly (and shyly) present to you this audio file to acquaint yourself a bit more with my Filipino tongue speaking American English. When you're done here, don't forget to count your blessings, especially those you take for granted as they have been so embedded in your daily lives. If anything, just be grateful for speech. *An excerpt from the book You Know You're Filipino If...A Pinoy Primer was read in the audio file.